Mister Maker Watch And Make Volume 5 is one of the newest releases from Abbey Home Media. We're familiar with Mister Maker, having before particularly liked one of his junk modelled cars and the almost infamous 'Beans On toast'. There are tons of craft ideas in here to keep you and your children busy for weeks, if not months. This DVD was great and my 4 year old is very keen to try the 'Splattered Space Picture', which is incredibly simple to make, but very effective, using splattered paint to create a starry backdrop, and simple brown paper ripped to rough shape to make craters and volcano-type mounds while his little brother was particularly taken with the 'Wobbly Eggs', created using a plastic 2 part egg which you would buy containing a toy and then usually just throw away. My favourite is the 'Fun With Bubbles' Octopus, with bubble wrap tentacles! I like Mister Maker because everything is simple to make and doesn't cost a fortune in materials. It also doesn't require the artistic talent that I lack. I can rip paper as well as anyone (maybe) and following his tips and guidance I can make a pretty cool space picture that's almost as good as anything my 4 year old can make! You never know, maybe I'll post a photo if I become confident enough in my own abilities! 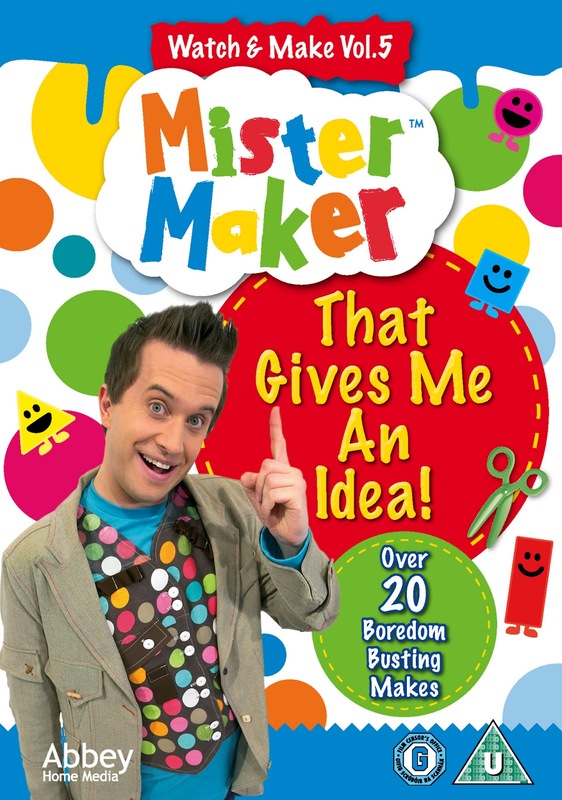 Abbey Home Media have kindly offered 3 x Mister Maker Volume 5 DVD's for me to give away to my readers. You can find the competition by clicking on this link. We give this DVD 4/5 and will definitely be spending some time this weekend buying tissue paper and googly eyes! He does have some good ideas doesn't he - we watched one at the weekend where he made a can of 'snakes' so that is on our list of crafts for the summer holidays!